Joshua 19 14: "And the border turned about it on the north to Hannathon". Tel (Mound) Hannathon is an important Biblical site in the entrance to the Netufa Valley, on the junction of ancient roads (coming from Acre, Sepphoris, sea of Galilee and Megiddo/Yokneam). It was in the heart of Lower Galilee and played an important role in the history of the land. Today it is in ruins. A large lake was constructed to the east of it, part of the national water project, reserving water that was pumped from the sea of Galilee and providing water to the center and south of Israel. 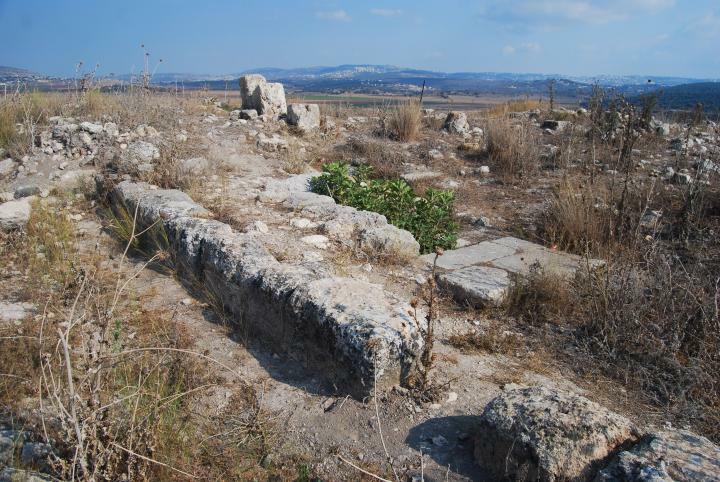 In the Hellenistic period the population moved to the hills to the south, a village called Shichin (Asochis), which was one of the Hasmonaim cities. 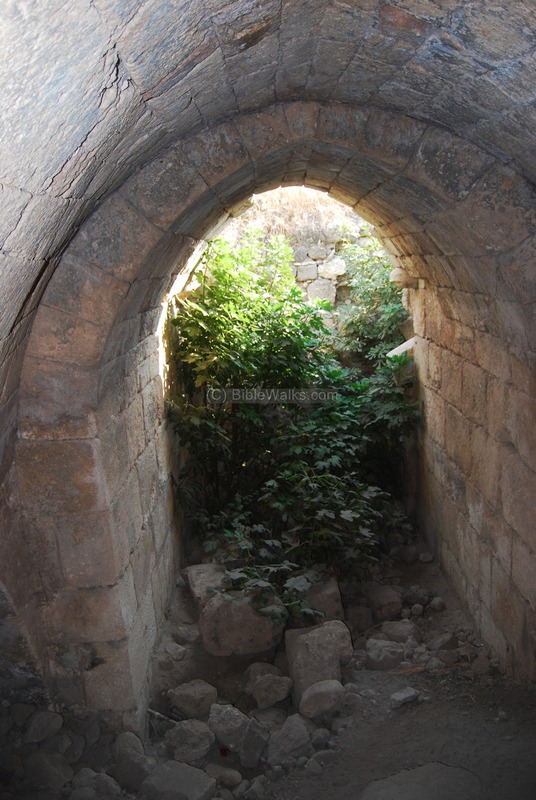 After the Jewish revolt it was a Jewish city and the place of one of the 24 Mishmerot Cohanim villages and cities (as per Chronicles 25, 7-18). The village continued until the end of the Roman period (7th C AD). In modern times a Kibbutz by the same name is located nearby to the south-west of Tell Hannathon. An Arab village, Kefar Manda, is located nearby to the north. The Tel is located on the east side of the road from Hamovil Junction towards Kefar Manda. You can stop and walk to the Tel. 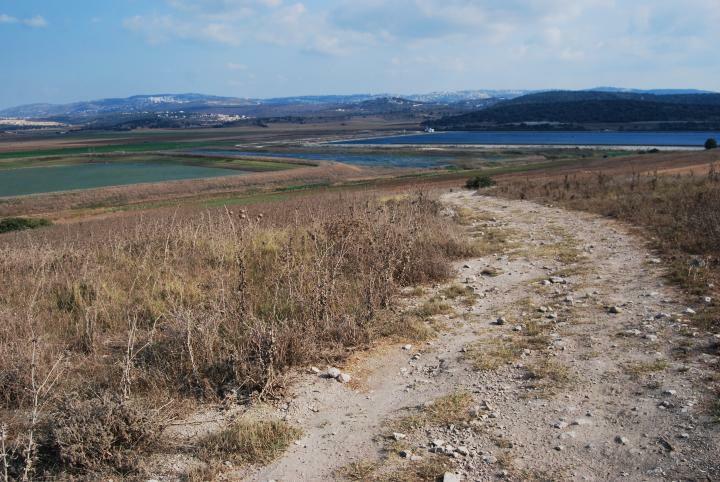 The village of Shikhin is located on the 2-3 hills south of the modern highway that passes near the lake, in the direction of Sepphoris. The cities and roads during the Canaanite and Israelite periods are indicated on the Biblical Map below. Major roads passed at this site - the one from Acco (Acre) to Sea of Galilee (indicated on the map), and the road to Shimron and then south through Megiddo. The city started to be populated in the Early Bronze (3150-2200 BC), and grew to a mighty fortified city in the middle Bronze (Caananite) period (2200-1550BC). In the late Bronze period (1550BC- 1200BC) the city expanded. 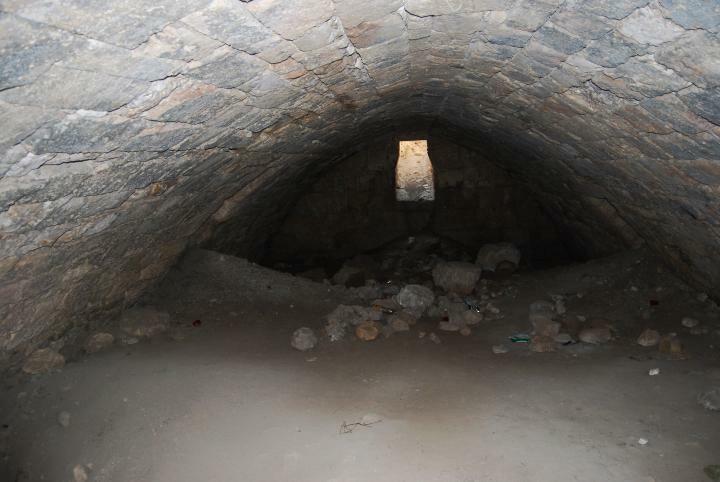 The city was protected by a glacis wall and probably by water around it, as it was located in the center of two brooks - Netufa and Yiftach-El . 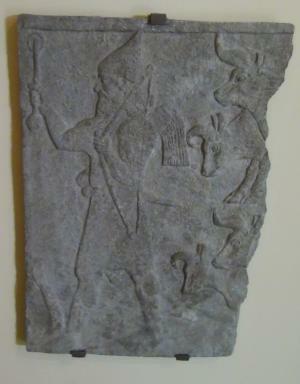 It was mentioned as "Hinnatuna" in the Amarna letters, a 14th century BC Egyptian archive of clay tablets, in an incident of a robbery of a Babylonian convey near Hannathon. According to recent ceramics survey, the lower Galilee area was in its peak until the 8th C BC. The number of large fortified cities was 5-6, and many more villages. Then, it all disappeared for 2 centuries (7th and 6th C BC). The reason, according to the surveyors, was the intrusion by the Assyrian King Tiglath-Pileser III which caused a major damage to the region. This catastrophe happened in 734-732BC , as told by the bible (Kings II 15: 29): "In the days of Pekah king of Israel came Tiglath-pileser king of Assyria, and took Ijon, and Abel-beth-maacah, and Janoah, and Kedesh, and Hazor, and Gilead, and Galilee, all the land of Naphtali; and he carried them captive to Assyria.". Hannathon is not mentioned explicitly in this text, but in the Assyrian lists (excavated in the city of Kelach) the city, called Hannathon, is mentioned as one of the sources of prisoners. The city relocated - as most of the Tels in Israel - to the low hills on the south-east, and was renamed Shikhin (or Asochis as referred by Josephus Flavius). It was captured by Thalami IX in 103BC when he fought with Alexander Yannay. The site was very close to Sepphoris, as described by Josephus. It was noted in Rabbinic sources for its pottery industry, similar to Kfar Hannania which was another ceramics center at that time. 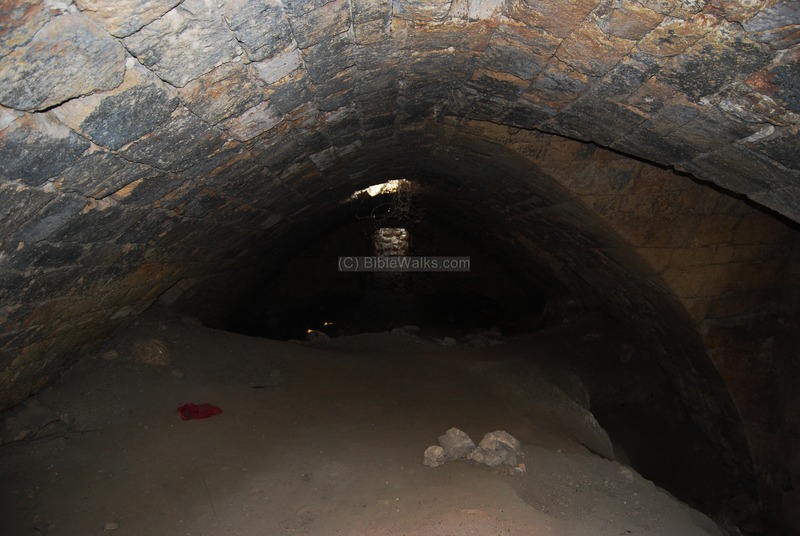 The Mishna tells us: "The vessels of Kfar Shikhin and Kefar Hanania are not likely to burst". Since it was located on the road from Sepphoris, Jesus must have passed through this village on his many travels between Nazareth and Capernaum. The village of Shikhin was probably destroyed in the Arabic period (7th C AD). Today the site is hardly noticed and is not marked on the maps. During the 13th C a fortified farm was built on top of the hill. 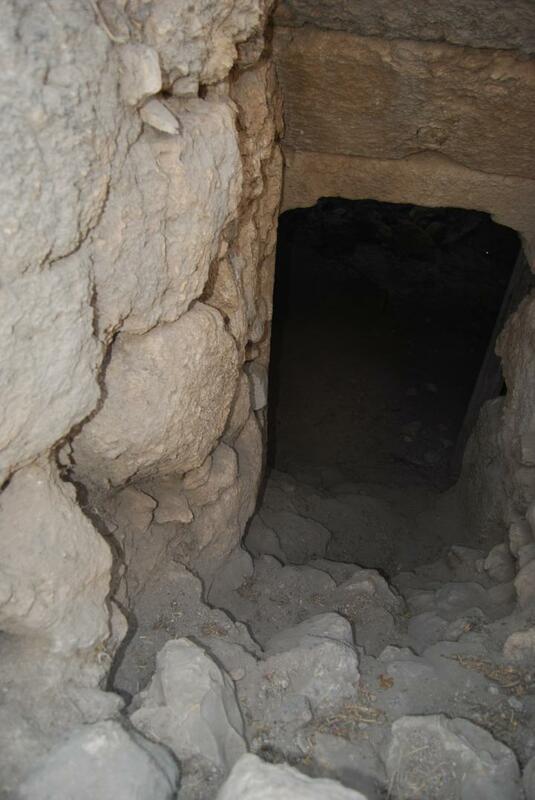 The underground halls of the structure can be visited today at the center of the hill. 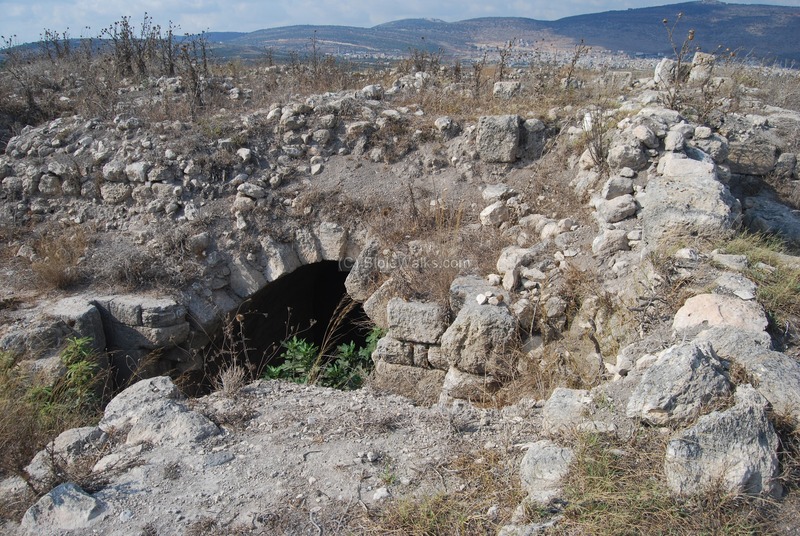 During the Mameluke and Ottoman periods, a roadside inn (Khan) was located on top of the hill, above the ruins of the Crusader fort. It was destroyed in the 19th C, but parts of it are still intact. The site was examined in the PEF survey (1866-1877) by Wilson, Conder and Kitchener. It appears as "Tell Bedeiwiyeh" in the center of the section of this map of 1878. It is situated near the Roman Road which is shown as a double dashed line on the upper left side. 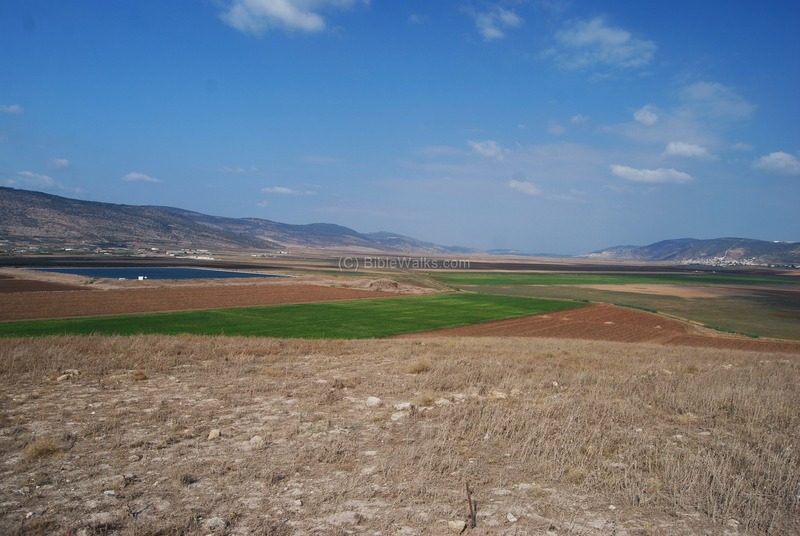 The Netufa valley is marked in Arabic as "Sahel el Buttauf". 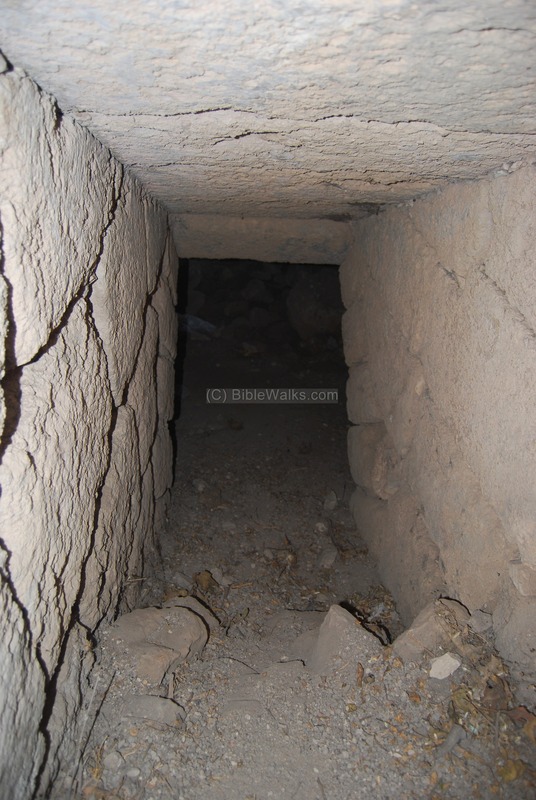 The surveyors suggested it as Kefr Annan, which was a wrong identification (that village is located in Kefar Hannania). They described Tell Bedeiwiyeh (in p 291 of the report, sheet V) as having "ruins of a khan for travellers", so at that time the roadside inn was already in ruins. The site is not yet excavated, except for small scale surveys. It is easily accessible and recommended for a visit to the ruins of the Khan and for the great views of the area. In 1984 a new Kibbutz was established to the south of the site, and was named after the ancient site. An aerial view, as captured by a quad copter, is viewed from the west side. The top of the hill is at 196m above sea level, about 50m above the valley around it. To the east of the site is a reservoir lake of the national water channel. Behind it, in the far background, is Sepphoris. Further east is Nazareth. 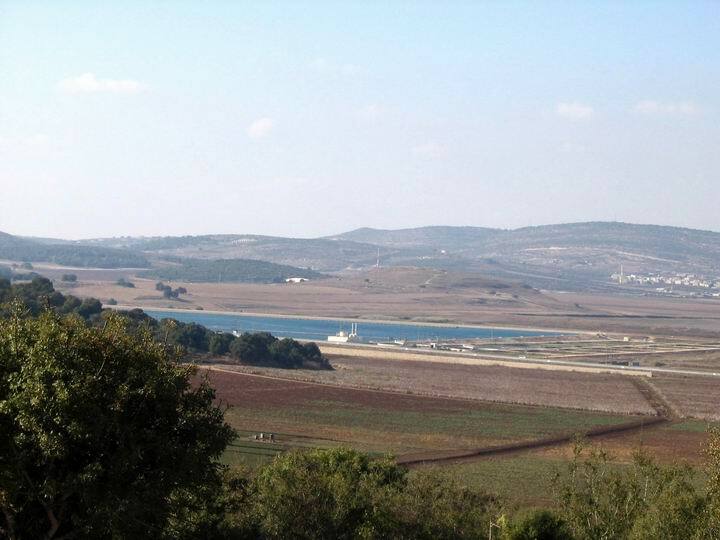 On the north side of Tel Hannathon is the wide and fertile valley of Netufa. 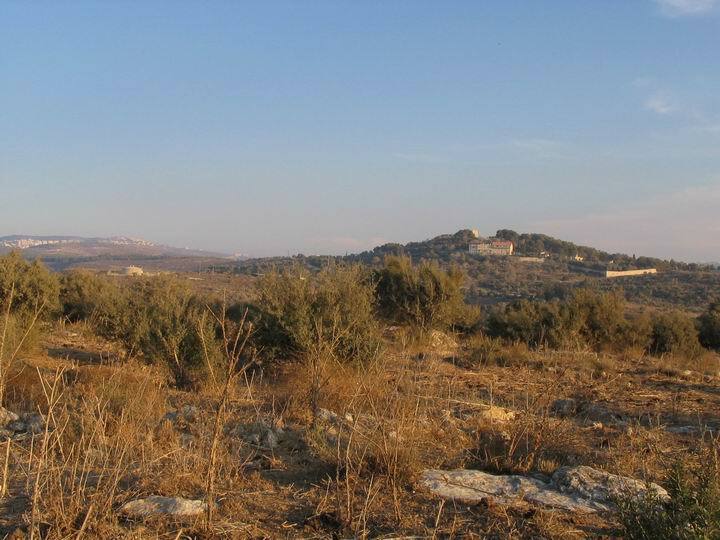 On the mountain, at the left, is where several important sites are located: Yodfat (Jotapata) and Khirbet Cana (a suggested place where Jesus performed his first miracle). The top of the hill is covered with traces of walls and structures. 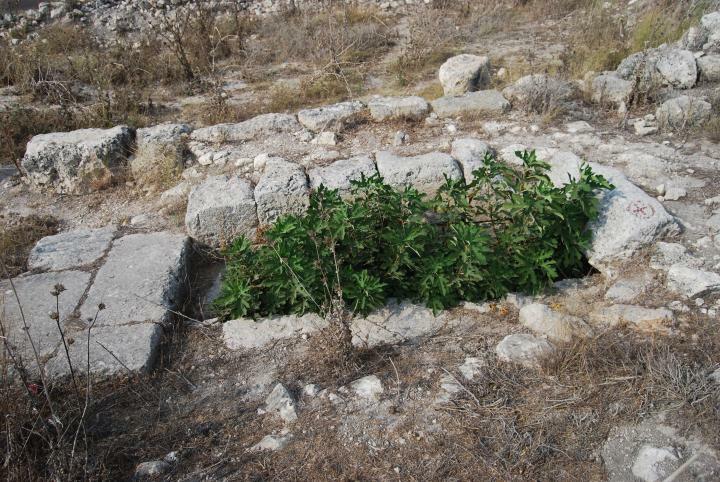 A small fig tree is seen in the next photograph, at the location of an opening. This is one of the two staircases that lead underground. Ascending down the steps, you arrive to an underground halls of the Crusader structure, which was later reused as a roadside inn. The photograph below shows the view of the underground hall. This is a good place to have a snack and hide from the sun. An arch facing the east side provides light into the hall. The arch on the east side is visible also from the surface. The north opening is seen in the following photo. The photo below shows the location of the north opening. On top of the hill are great views of the area. 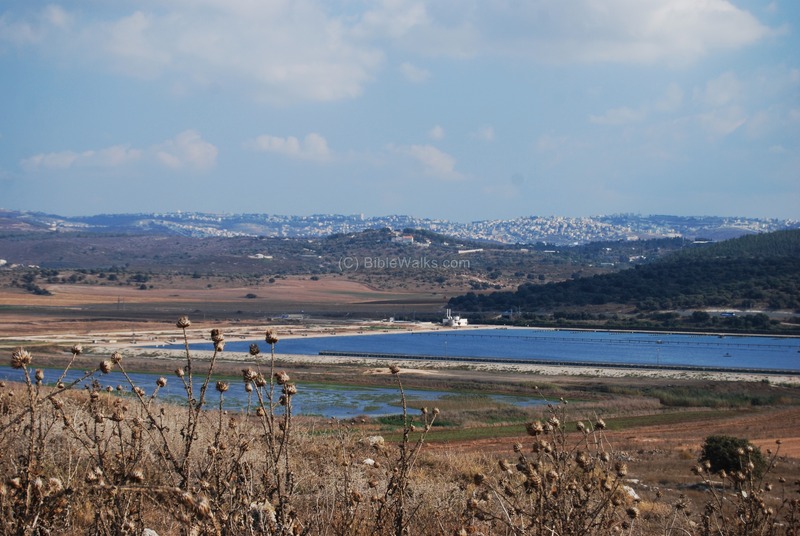 In this south-east view is the large water reservoir, which is part of the "National Water Carrier" which brings waters from the Sea of Galilee to the south of Israel. 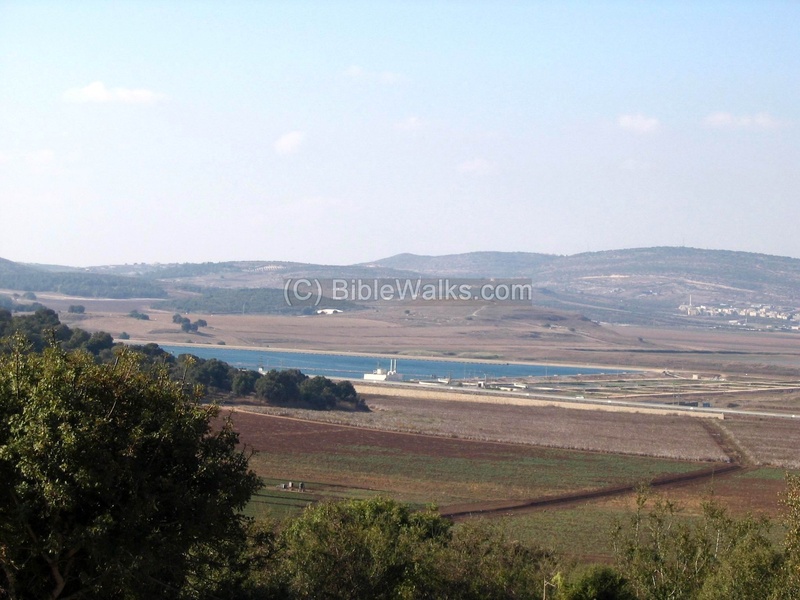 Behind it are the ruins of Sepphoris, and in the background is the city of Nazareth. A north view is seen in the next photograph. 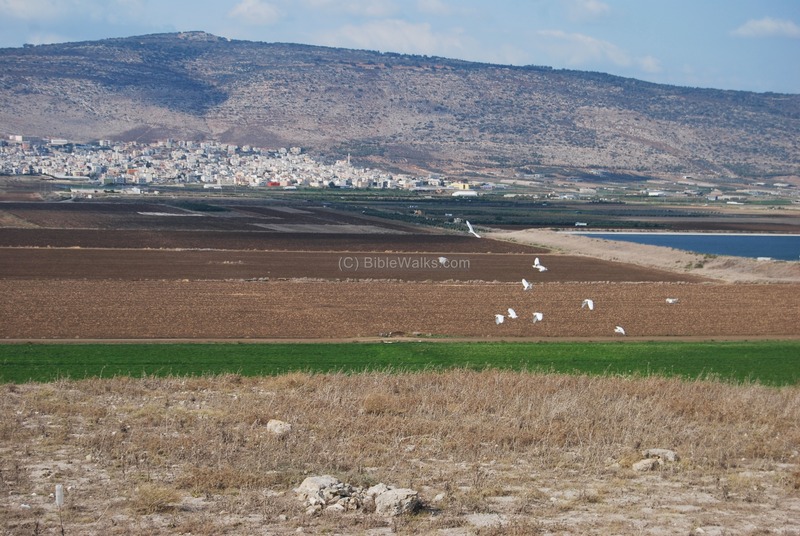 Kfar Manda (Minda, Menda) is a large Arab village which was based on a Jewish Roman/Byzantine village named Kfar Mandi, which lasted until the Mameluke period. 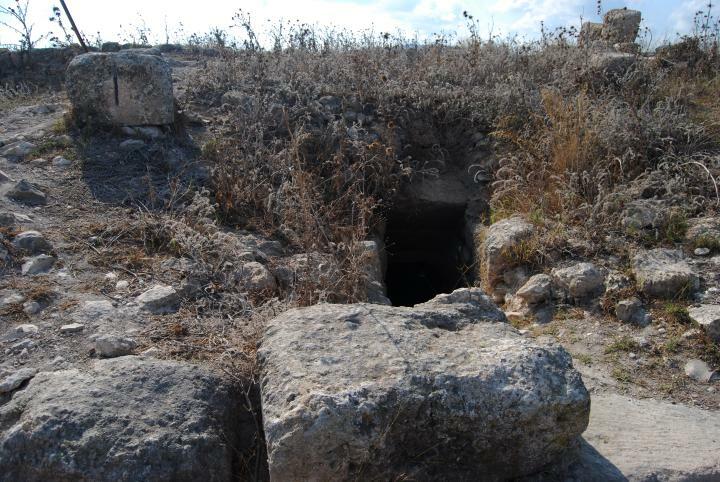 Ancient Jewish tombs (Akabia ben Mahalel of the second temple period; Shimon ben Gamliel president of the Sanhendrin) are located in this village according to Jewish traditions . The hill behind it is Mt Atzmon which is located above Jotapata (Yodfat). A view of the western foothills of Hannathon is seen below. 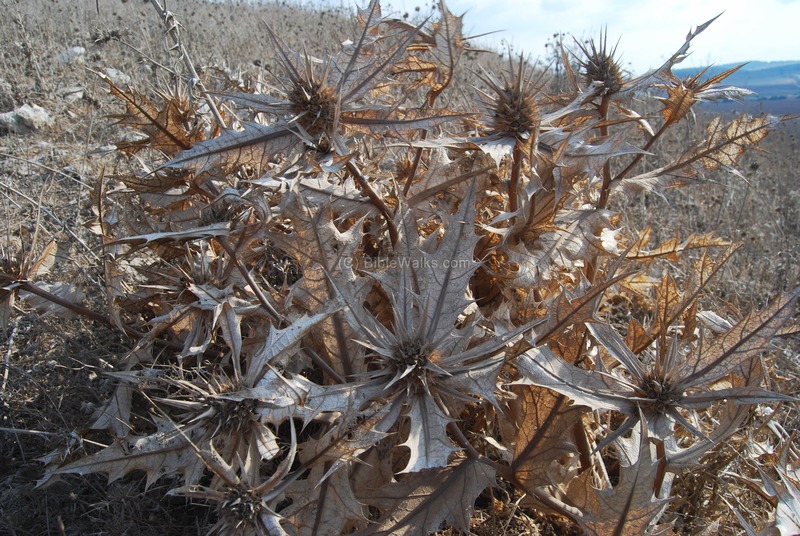 Along the foothills are dry leaves of a large thorn. The newer village of Shikhin was a continuation of Tell Hannathon in the Hellenistic period. The population moved to the new site due to the limited area of the Tell. 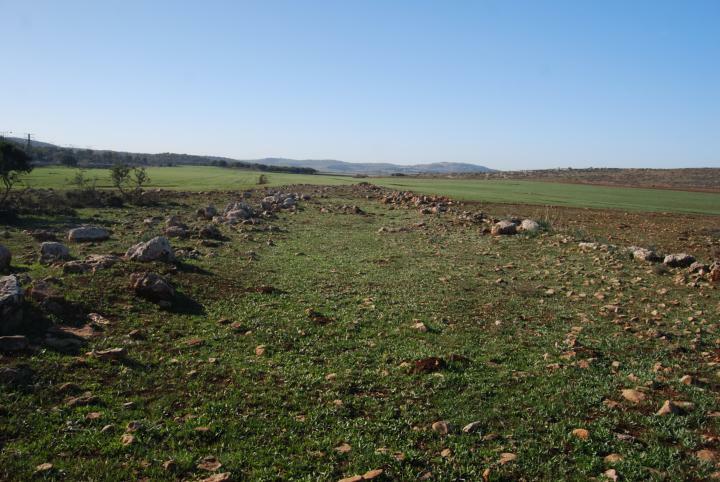 The new location occupied a larger area, spanning 2-3 hills in the area between Hannathon and Sepphoris. The photo below was taken from the ruins of this village, on the hills south of Tell Hannathon. Tell Hannathon is seen just after the lake (which is part of the national water works project). The next photo was taken towards the south-east. On the top of the hill is the ancient site of Sepphoris. The village is very close and downhill to Sepphoris, as described in Josephus books. 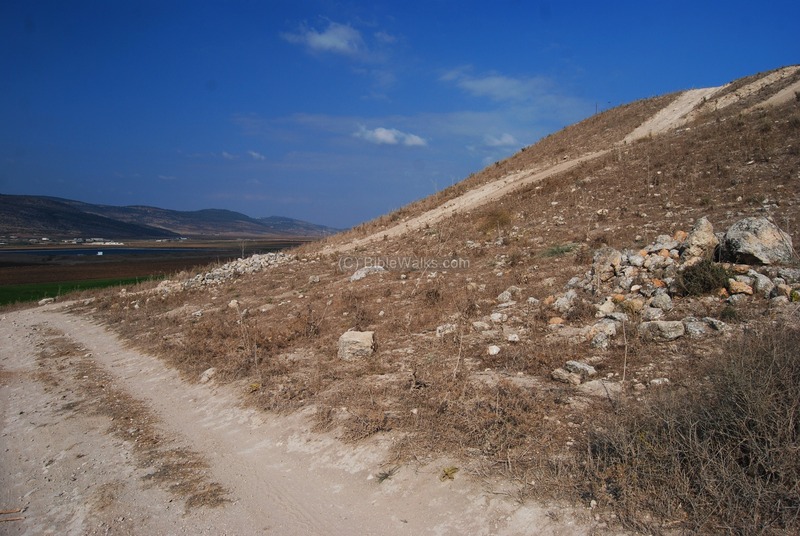 There are few remnants of the ancient hill of Shikhin, since the stones were hauled away to be reused in the building of the monastery in Sepphoris. 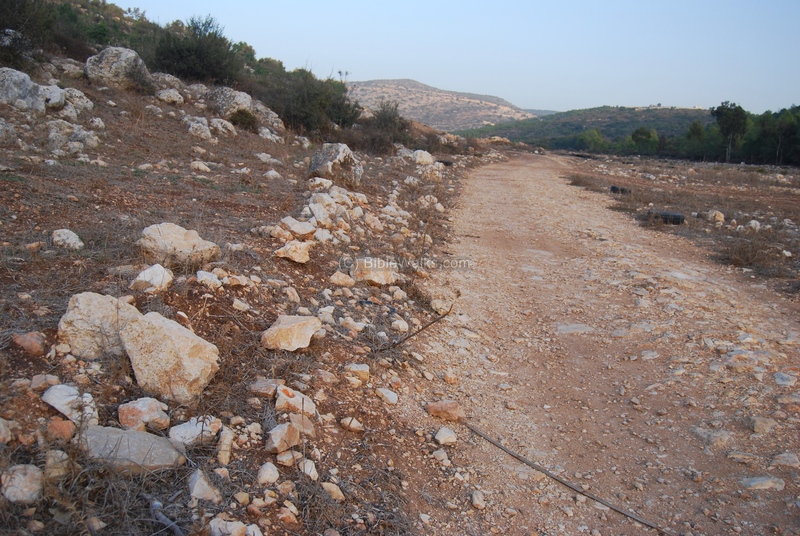 The photo below shows a small section of the Roman road to Tiberias, seen in a field south-west of the Arab El Heib village. This route goes through the Yiftachel valley, and reaches the Netufa valley and Tell Hannathon. A group of milestones were also found at the site. The next photo is a section of the Roman road along the Ibilin creek to Acre. This text described the borders of the Tribe of Zebulun (Zevulun). Note that the valley of Iphtahel, mentioned after Hannathon, is the valley south of the Tell, which flows into the Zippori creek. 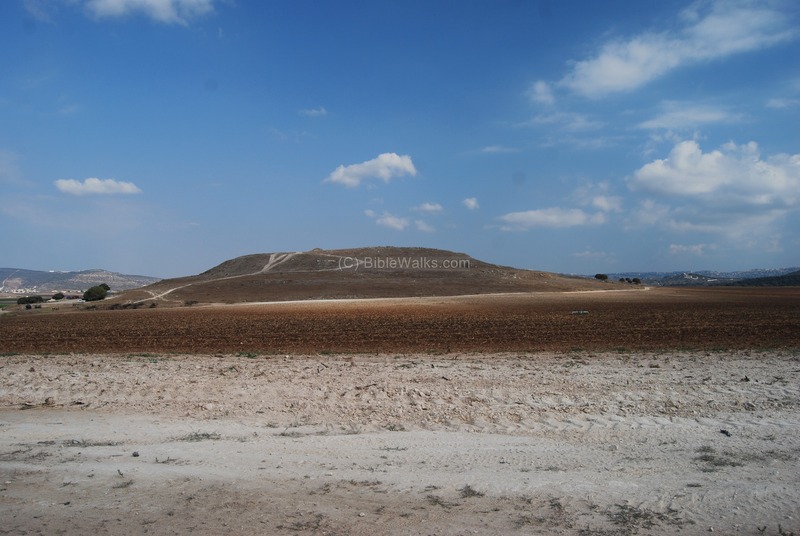 The historian Josephus Flavius, the commander of the Jewish revolt, writes about the place (called Asochis, or Shikhin) and tells us it is very close to Sepphoris. From the survey of the hills north-west of Sepphoris, there are two hills close to Tell Hannathon that were the place of this village. The Location and Identification of Ancient Shikhin (Asochis) - Israel Exploration Journal, 44, 3-4 (1994), pp. 216-227, and 45, 2-3 (1995), pp. 171-187. Hannathon - In Hebrew the root word "Khana" means "parked". Hanathon therefore means the place to stay. Indeed, it was a motel type city. Shichin is from Sichim, or bushes in Hebrew (The fertile area was full of bushes and hence this name). The Tel (Tell) - the story of a Tel.